Winter is the season where many homeowners decide that their heating system just isn’t right for them. After all, you’ve gotten well acquainted with your heater these past few months. Any problems with your heater that were pushed into the recesses of your mind by the blaze of summer are back at the forefront now. If your heater just isn’t cutting it, don’t be afraid to upgrade. When it’s time for an upgrade it’s best to consider all your options. This process can be a bit overwhelming because now more than ever there are so many great ways to heat your home. While the vast majority of people across the nation choose to heat their homes with forced air furnace systems, a tried and true classic is radiant heating. Radiant heating is still a great option for our bitterly cold Boston temperatures. If you’re interested in putting a boiler in your home this winter then ask our educated technicians about installing a boiler in Boston, MA. We have all the information you need alongside the best models of boilers from the best brands. Let’s move away from jargon for a second. Generally speaking, when someone speaks about “radiant heating” they’re talking about a boiler, and when someone talks about “forced-air heating” they’re speaking about a furnace. There are other types of heaters that go into these categories, but these are the main two and the two we’re choosing to talk about today. Radiant heating systems distribute thermal energy by transmitting it through solid objects rather than air. A boiler system, in particular, uses heated water to distribute heat around your home. 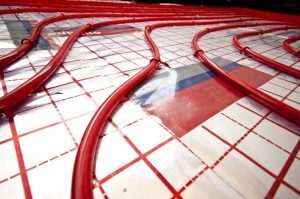 So what are the benefits of radiant heating? Why should you make the switch? So many people sing the praises of radiant heating for comfort. Radiant heating feels different. Instead of it giving off hot gusts of air, radiant heating feels like the sun shining down on you. Radiant heating is also more comfortable because it’s better for your indoor air quality. Do your hair, skin, or nails start to feel bone dry or brittle in the winter? Is this especially true when you run your heater? It’s because of the low humidity levels in winter exacerbated by the drying effects of a forced air heating system. You can bypass these problems when you use radiant heating in your home. Boilers are typically a much cheaper way to heat your home. Hydronic heating systems are even up to 30% more efficient than forced air heating systems in some cases. This is because water conducts heat a lot more efficiently than air does. Plus, you won’t have to worry about your losing any efficiency in a ductwork system. Sometimes your home doesn’t feel as heated as you want it to in winter because all the heat is rising and staying near the ceiling. This is a persistent problem for forced air heating systems. Radiant heating systems slowly heat rooms at a uniform rate, which provides you with more comfort at a better cost. If you’re interested in installing a boiler in your home this winter, contact our team here at Cooling Unlimited, Inc.